Perfectly healthy people almost never die suddenly unless something terrible happens to them. Can a 70 year old skeleton provide enough clues to finally solve the mystery of what happened to a privileged young woman who disappeared in 1916? Imagine discovering human remains while on a long hike. As soon as I read the heartbreaking description of the skeleton that is discovered in the opening scene I couldn’t wait to find out how the victim died and why she came to be buried in a such a lonely place. My curiosity bubbled over when one of the investigators realizes the deceased is related to him. This detail added a sense of urgency to the plot and gave me sympathy for certain decisions Frank makes later on in the course of his investigation that otherwise could be construed as insensitive. Despite the fact that they never knew one another I noticed striking personality similarities between Libbie and Frank that I wish the author would have explored in greater detail. Both characters are good looking, intelligent, and charming, but they also tend to be self-absorbed and indifferent to the emotional pain they cause others. Frank begins to show signs of self-awareness as the plot progresses, but realizing how much he has in common with his long-dead aunt would have provided an excellent opportunity for further character development. What I liked most about this novel was how seamlessly the plot jumped between the last few months of Libbie’s life in 1916 and the investigation of what really happened to her 70 years later. Both time periods provide vital clues about Libbie’s fate and even though they both discuss the same events I was always intrigued by the subtle differences between the memories of the witnesses and what actually occurred. 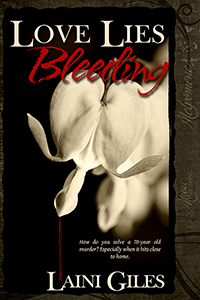 Love Lies Bleeding kept me guessing until the end. This is a great choice for anyone who likes richly detailed historical mysteries set in the beginning of the 20th century.